Set in an auspicious location (Sheenun – the mountain of fairies) – made according to sacred building & Feng Shui principles. A place for healing and recreation realized from a Feng Shui practitioner – for sale (price update nov. 2013 – see below). This is the story about a different attitude towards housing – creating a living space that is a natural consequence of a deep appreciation towards all life and meant as a support for a holistic, spiritual life. 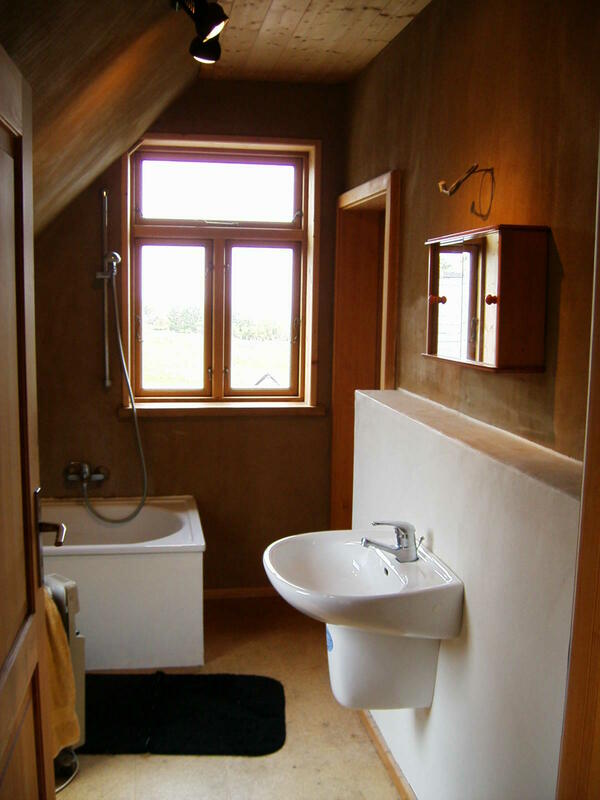 It highlights an unconventional building project that was realised in Rossinver, Co. Leitrim, Ireland from 2000 to 2004. With the aid of Feng Shui, ecologic building materials, geomantic and harmonic principles it has been my intention to build a house that is in tune with the sacred principles of life – for it to be a powerful healing place for anyone who has the opportunity to live there. 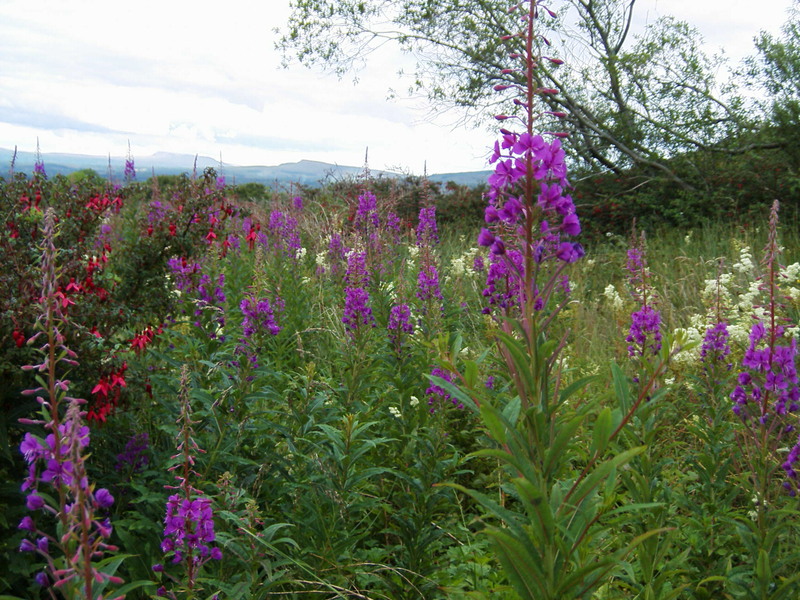 In August 1999, after spending a night at a sacred site in the northwest of Ireland, I was guided to a unique and powerful plot of land – the site that I was looking for! 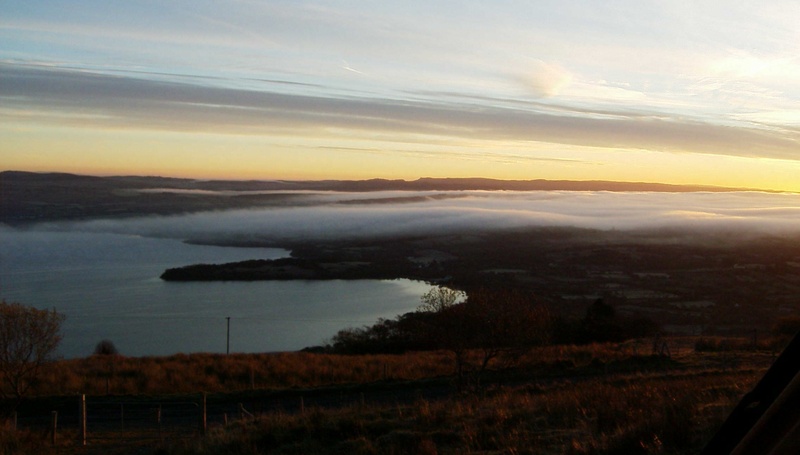 The site is located overlooking 4 counties high above a beautiful lake (Lough Melvin). It is at the foot of a mountain trek which is considered to be one of the most beautiful (and most unknown) hillwalking paths in Ireland. In close proximity of the path, there are some interesting energetic places, two sacred sites (a druids cave at the top of Sheenun mountain and another ancient ceremonial site – yet undiscovered by the public). The Sheenun mountain marks the geomantic centre point for the whole area, it is connected (through a minor line) with the major synchronic line of Ireland that links Ireland with Stonehenge and the Gizeh pyramids. The level of Qi (life energy) on this site is very high. The importance of the quality of life energy at the place where you live can not be over-emphasised. Life energy or Qi (in China), Prana (in India) is the energy that is responsible for directing any life process within all living beings. It is directly involved in forming physical matter. Life energy its self is non-physical – it is not organised in atoms. Qi and prana is connected to the sun and the etheric plane. Scientists assume that we receive 2/3 of life energy as cosmic energy and 1/3 as energy that comes directly from the earth. It is essential for all living beings to receive enough life energy to be able to stay alive and healthy. On a cellular level, the life energy is stored in the DNA spiral. Most of you will know that it also flows along so called meridians and that it is stored in several energy centres (called chakras) in the body. We take in life energy with food, water and the air. We also take it in from the light of the sun and directly from the environment where we live. If we live in a house with low energy, we may feel constantly drained and can’t live our full potential. To live in a space based on sacred principles (Feng Shui, Vastu Vidya and geomancy) is not only a great help for ones own health, it will also help the spiritual development and provides a sense of peace and attunement with our environment. Why do people live a holistic, spiritual life? Trying to put it to one point: it is about creating order – order within and around us. We get in order if we come closer to god (no matter if we call it god or the universal light – the source of all life and universal creation) – we raise our vibration. Our hearts get lighter and fuller of love. If we live in a house that provides us already with a higher vibrational level it can be a great support to get there – it is so much easier to connect with ones inner divine presence if the environment reflects perfect harmony. As a Feng Shui practitioner, I have had to work in so many houses that had far more potential to make their inhabitants sick and wear them out, than to help them heal and grow – they were seriously lacking life energy. Sometimes they were built on geopathic stress zones, exposed to high electromagnetic fields, burdened with negative karma or negative spiritual presences. There is a great deal of things you can do to change and improve such situations but it will never be as vital as if it had been done right from the beginning. 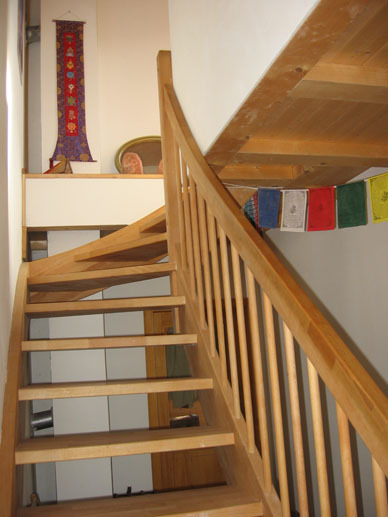 The Sheenun House is in a location that provides a high level of Qi – not everyone will be as lucky to find such a spot, but if you read about the following measurements you’ll get some ideas how to create a vital house. The front of the Sheenun House faces east, so that at sunrise the light of the sun reflects in the lake, before it touches the front of the house. The moment of sunrise is very auspicious and this setting allows a perfect balance of yin and yang energies. Here are some more structural measurements: the base slab of the house is not metal reinforced and the metal in the outside foundation wall does not form a closed circuit. This makes sure that the earth magnetic field is undisturbed – a very important measurement for every new house. By the way – did you ever think about how your matress changes the earth magnetic field – try it with a compass! Maybe you would like to get one without interior metal springs in future. The house is made out of wood which has not been treated with toxic chemicals – a waterproof breathing membrane makes the walls breathe and avoids water damage. 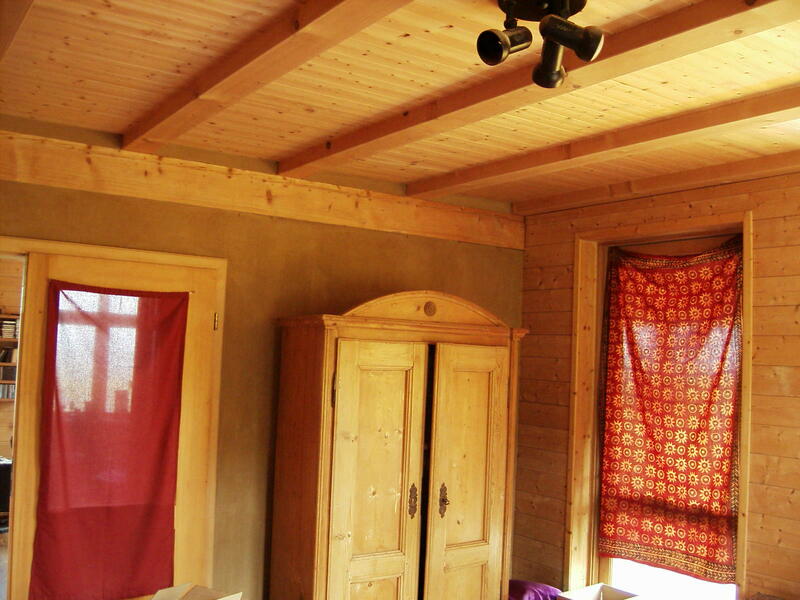 All materials are ecologic and free of toxins – the house is insulated with hemp and woodfibre boards –it is really warm and cosy. The wood for the house is of very good quality. It is from german forests and has been cut in winter time. The douglas-fir and larch trees that are used for the floor have been felled on a very specific day in the year – on a specific moon phase. It is known from ancient austrian moon calenders, that trees that were felled on this specific date give extremely hard building wood and don’t shrink. My carpenter didn’t believe this at first but when he saw the wood he was very astonished, he said he had never seen floor boards that do not move or shrink at all and get so extremely hard. 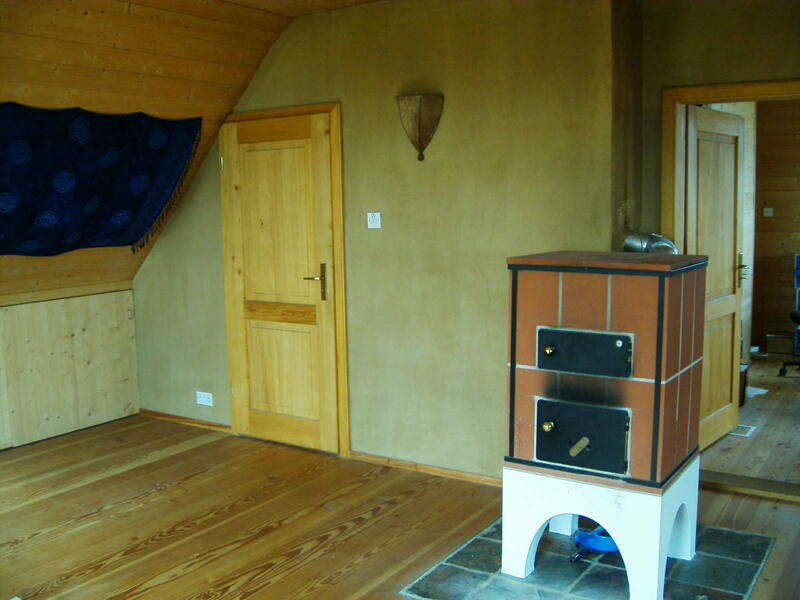 The walls are made of solid vertical timber beams (this is not a cheap timber frame house) all the way round. I made sure that the timber forming the wall was built in with the right energetic polarity. When a tree grows, the top of the tree forms a positive pole and the bottom at the roots form the negative pole. This polarity remains, even when the wood has been processed into boards and beams. Knowing that the energy in the house will be more harmonious when the beams are build in with the negative pole to the earth, I made sure this principle was applied during the building process. The windows and doors of the house are made of Victoria oak (australian oak). They are extremely solid and durable and very beautiful. 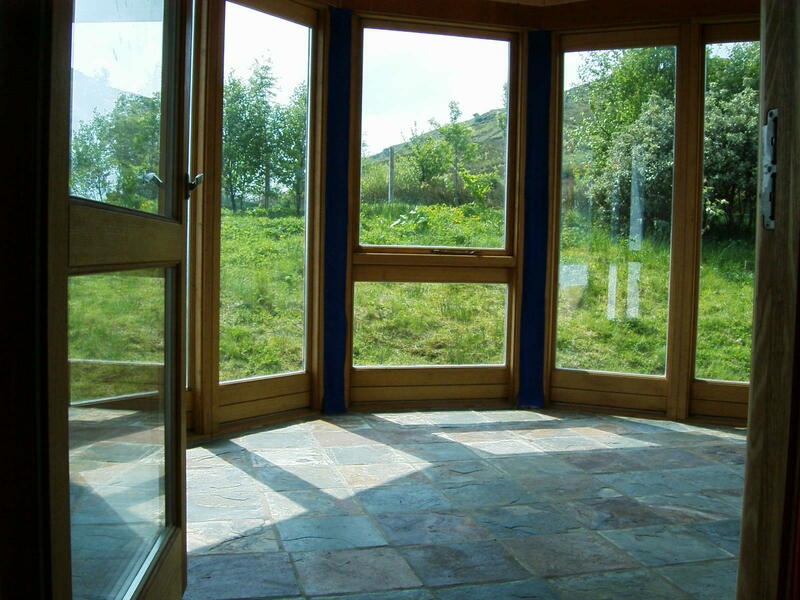 The whole conservatory has been made with australian oak windows and doors. The interior doors are first quality german joinery work. Most of the interior work has been done by myself and a friend. We made sure that every step is done very precisely and with love and care. 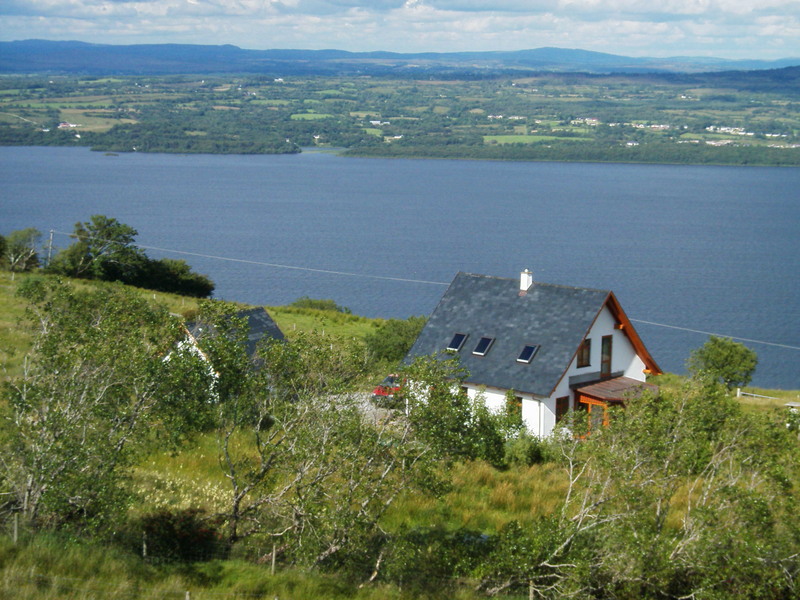 The outside of the house has been designed by an Irish architect, to make sure it will suit its environment. The interior design is very natural and functional – it is an open architecture with big rooms and lots of space. One big living room with kitchen / dining downstairs facing east with view of the lake. Another large room to the southwest and a smaller one that can be split and converted into a toilet / shower or utiliy, if desired. 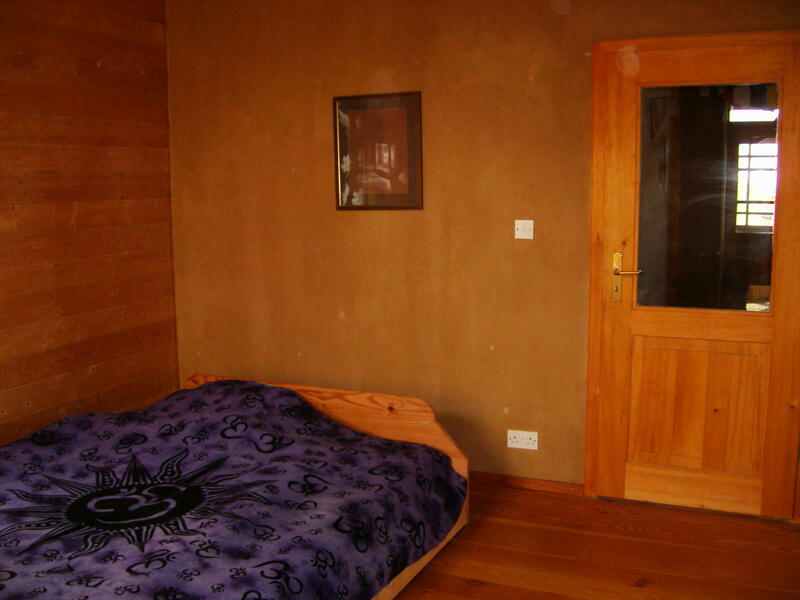 Upstairs there is a large bedroom and a smaller one and the bathroom. Two masonry stoves are the main heating system – they burn turf and wood and create a healthy and energetic atmosphere. The key to a healthy and energy efficient heating system is not to heat the air! Masonry stoves and wall heating systems have a low temperature surface compared to metal stoves and radiators. That means they do not create convection in a room – they heat by radiation. The same principle as the sun – if you are out in spring on a cool day the sun can warm you, even if the air temperature is low. You do not breathe in so much dust and the infra-red radiation of the stoves is very beneficial. This is a huge health benefit – in contrary to the often used underfloor heating systems. They create a very unhealthy atmosphere, bringing up lots of dust in the air, and even worse creating geopathic stress everywhere in the house due to the running water under your feet. If desired, the heating system can easily be extended with a low temperature ecologic wall heating system. The Sheenun House has big and specially insulated windows to let in a lot of light and at the same time to comply with a low energy house insulation standard. 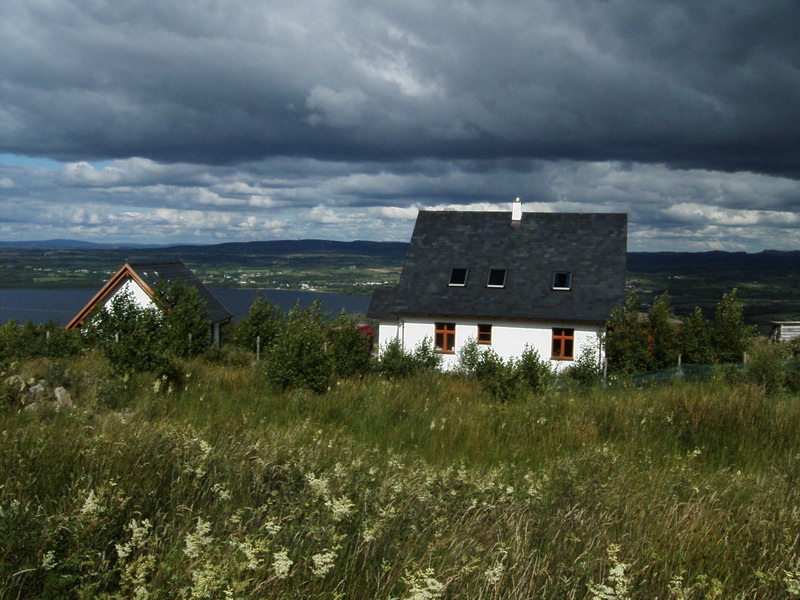 The electric installation follows the principles of “building-biology” to avoid “electro-smog”. 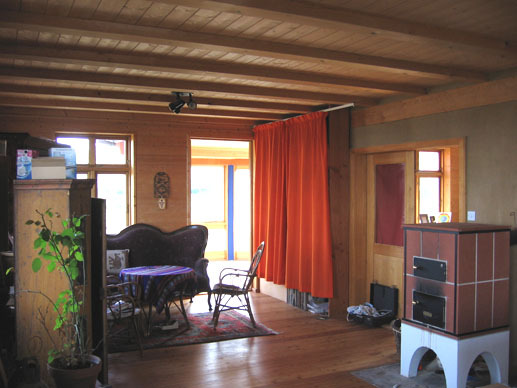 The building system (Sattelberger Holzhaus) is one of the most solid and ecological systems that are available in Europe. This construction type has been recommended to me by one of the most regarded pioneers in ecological building in Germany. Holger Konig, architect and author of numerous books about building biology recommended this construction type to me as one of the most reliable, solid and truly ecological ones that he knew of at that time. Traditional Feng Shui has been used to evaluate the most auspicious position for the entrance door. The rooms are designed in a way that the life energy is evenly distributed and not trapped – it is in flow. Different energy centres in the house have been activated to enhance the cosmic connection for the inhabitants. The biological effects of high frequency radiation from Mobile phone and WIFI masts are shielded; they can not enter into the house. 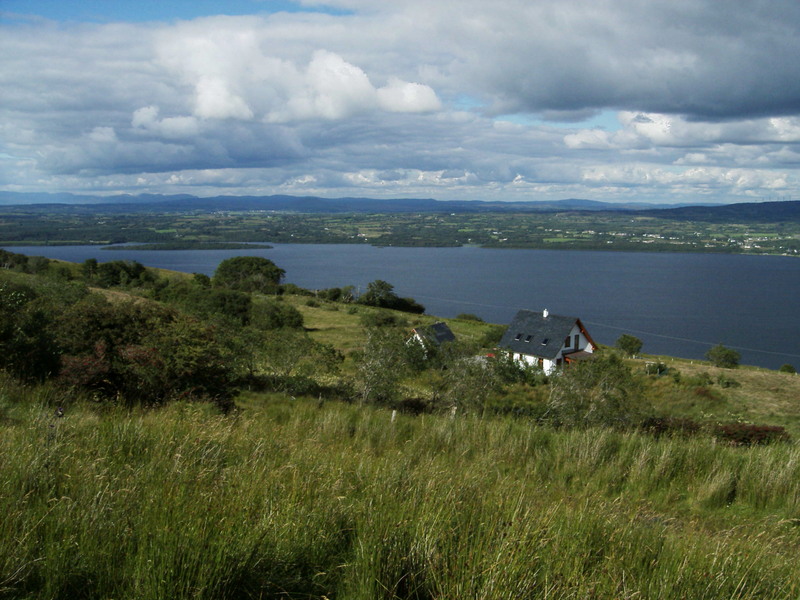 The Sheenun House is located in Rossinver, County Leitrim. 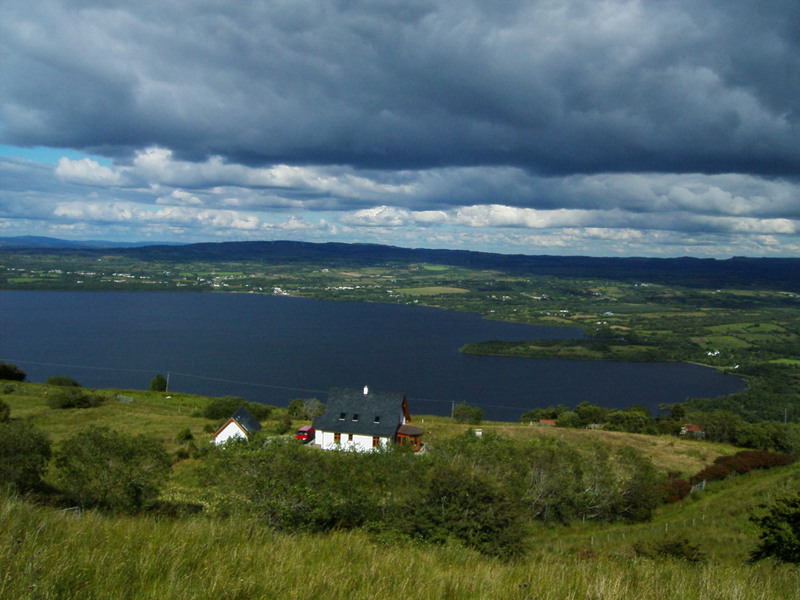 Leitrim is one of the least densely populated areas of Ireland. The wildlife and natural beauty in this county is unspoiled and breathtaking. In spite of numerous beautiful mountains and lakes tourism here is still very little. 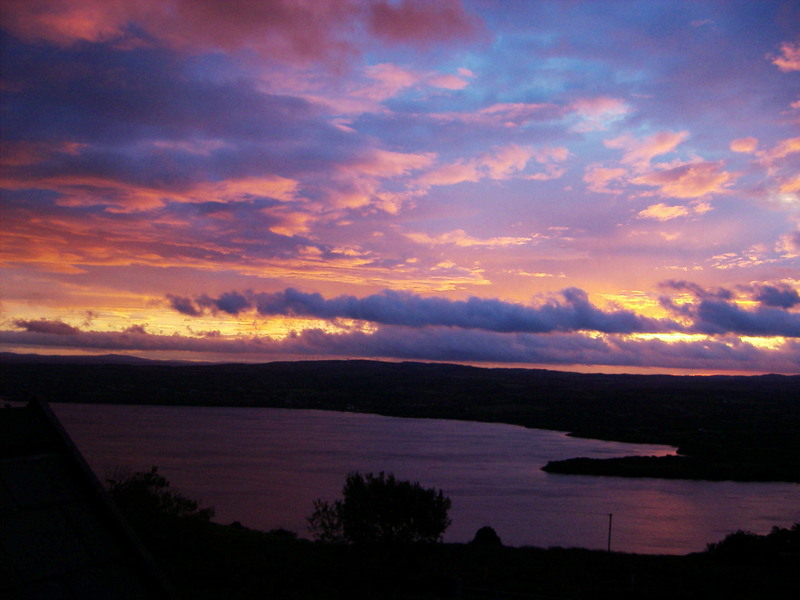 Leitrim is known to be one of the best counties for Irish art and music (check out http://www.studionorthwest.tv/ for more info on local culture). 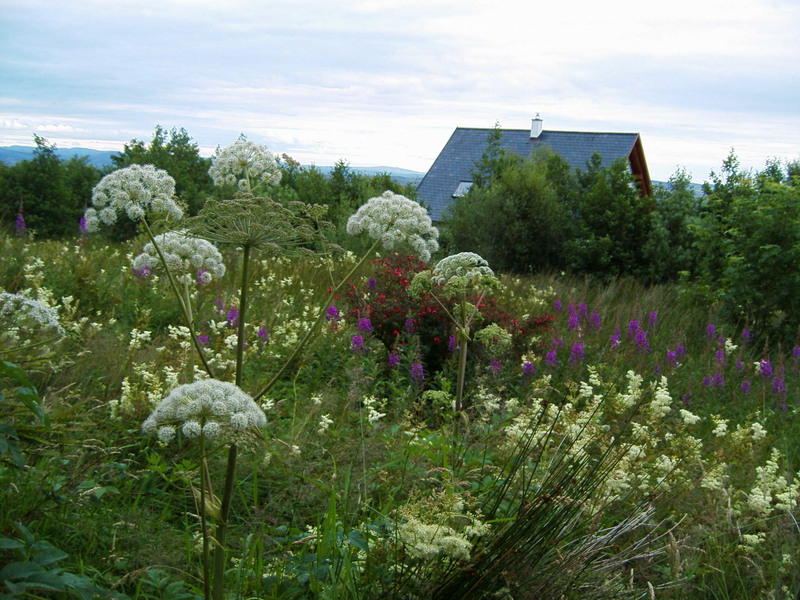 The Organic Centre in Rossinver is a hub in Ireland for courses on alternative living and ecology (http://www.theorganiccentre.ie/). There are golf, tennis, surfing, gymn and horse riding opportunities within 15 min drive. 2 hours from Belfast and 3 hours from Dublin. What more can I say? I was ill and it helped me healing in an astonishing way. Since I live there, all events seem to fall in place to the right time and obstacles seem to dissolve (if I don’t create too many for myself). And now the good news: as I have benefited from this sacred space now for a while, new projects are calling me to leave – the Sheenun House is looking for a new owner now. Please get in contact if you think you would like to live here. Update on price: I reduced the price from originally €650,000.- to €360,000.- (price guide but open for reasonable offers). Frank Albrecht is working as Feng Shui and Holistic Health Consultant. He is available for Feng Shui Consultations and examinations for geopathic and electromagnetic stress throughout Europe. He can be contacted per email: info@thelife.ie or phone: 00353-719854186. This entry was posted on July 20, 2011 by sheenun. It was filed under Uncategorized .